March 2-9, 2019 Virginia our 33rd state. Virginia is for lovers. Ever wonder why we say that? It was a tourism slogan thought up in 1969. Two guys thought of an ad that would highlight the beaches, mountains and history of Virginia but instead of having Virginia is for beach lovers, Virginia is for mountain lovers and Virginia is for history lovers, they shorted it to Virginia is for lovers. On this stop in Virginia we are History lovers. We hope to come back to spend time in the mountains and beaches one day. Our large spot backed right up to the water in the woods. We had another windy night here but didn’t pull the slides in which means we didn’t sleep well. It was neat to watch the rowers practice on the river everyday. We loved imagining that the explorers would stop right here as they charted these waters. It is located next to Jamestown. There is nothing more historic than visiting the town of the first permeant settlement of Englishmen in our country. This area is laid out in a historic triangle that includes Jamestown, Yorktown and Colonial Williamsburg. We started with Jamestown then Williamsburg and finally Yorktown so we could go in chronological order. You’ve probably heard the legends of the settlers that first arrived in the spring of 1607; of Captain John Smith’s leadership; of Pocahontas’ role in smoothing relations between the settlers and the Powhatan Confederacy. 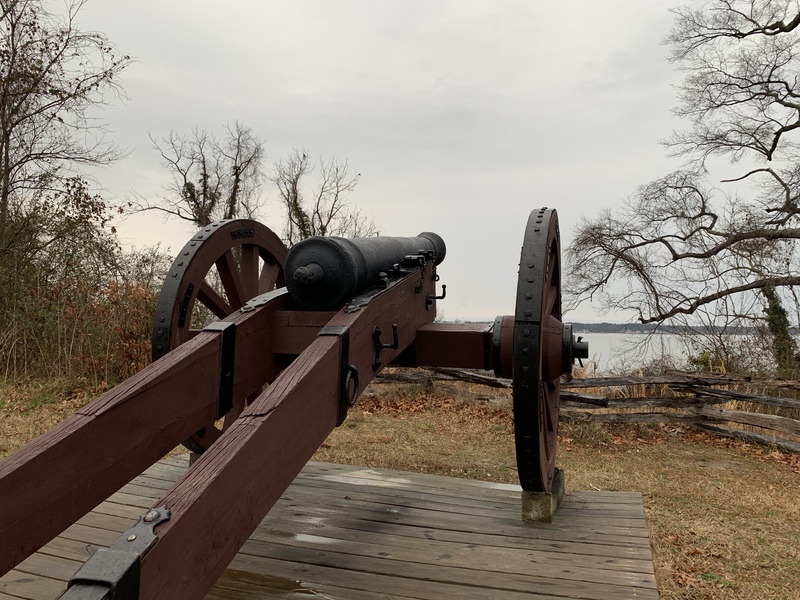 All these historical stories are on display in museums, exhibits and monuments around “Jamestown.” This area is technically made up of several historic areas. First up: Historic Jamestowne, the actual archeological site on Jamestown Island where the original 1607 settlers were based. Next door is the Jamestown Settlement, a re-enactment museum with replicas of the settlers’ ships, plus life-size models of their homes and the villages of the Powhatan. The last time we visited this area, two years ago, we didn’t realize that there was more after the Jamestown Settlement building with the ships. There is a whole other area that is owned by the National Park System. You just have to drive further past the Jamestown Settlement. Which isn’t actually the site of the first English PERMANENT settlement. You have to drive back to this Historic section on Jamestown Island to see the fort, the site of the first English permanent settlement where John Smith landed. I am emphasizing English and Permanent because obviously there were native people living here before the English invaded and the Spanish made colonies down in Florida. Also John Smith’s crew were not the first English group to set up a colony- that was down on Roanoke Island in North Carolina. They were lost, thus called the Lost Colony. No records were kept therefore they aren’t considered a permanent colony. The indoor museum is really nice with a great theater and film. The theater is round with viewing from all angles. The outside open air museum is fantastic with another indoor museum near the water. This museum was closing shortly after we arrived but the girls had time to finish their scavenger hunt books thanks to a wonderful gentlemen that took time to teach the girls about a few really cool artifacts. The girls earned their ranger badges here. You do have to buy the books for $1 in the bookstore. The only other place we had to buy the books was in Hawaii at Pearl Harbour. Our favorite may have been the glass blowing house. They have the actual pits preserved and on display but they also have a replica of the glasshouse and are actively blowing glass from 8-5 everyday. The first day they were making candlesticks and the second time (we loved it so much that we stopped by another day) they were making beer mugs. Here is the actual glasshouse area and artifacts from 1608. This is glasshouse they use to demonstrate how they made the glass items back then. This museum is not run by the National Park system and requires a separate admission fee. We visited this two years ago and loved it so the girls asked to visit it again. We arrived at the perfect time in that the school groups were leaving. Only one of the three ships, Discovery, was available for us to walk on this time. Susan Constant, Godspeed and Discovery are re-creations of three ships that brought America’s first permanent English colonists to Virginia in 1607. The disadvantage of visiting during the off season is that things are being restored or renovated. We had the native village to our selves. We braided river grass for baskets, played games and scrapped deer Hyde with oyster shells. Inside the re-created English camp we watched a musket demo, tried on their armor and followed the free range chickens around. Sunday was cold and rainy so we just had a relaxing morning and then walked the streets of Colonial Williamsburg in the afternoon. You can walk the streets without buying a ticket but you can’t go inside any of the buildings. That’s all Chris wanted to do so we decided to wait to buy our passes. We parked in the 2 hour marketplace parking and casually strolled around the cobblestone roads. We picked up the schedule sheets for the week at one of the gift shops so we could plan which three days we wanted to visit. I’m sure they deserve this…. We would love to live on a street like this one. We stopped by the Glass blowing house again to see what they were making today; beer mugs and vases. Watching fire is always mesmerizing, mix in blowing through a tube to shape it and the warmth of the room- it was hard to leave. Abby bought a bow and arrow set this week and spent everyday perfecting her technique, she loves it! The girls and I bought the three day ticket which is cheaper during the winter months. Of course, that’s because not everything is open and there aren’t as many programs. It’s still totally worth it. You can actually get an annual pass at a huge discount if you are a homeschooler so I did that because it gets you into member only events and you get a nice lanyard 🙂 We still enjoyed what they had to offer and with the discounted rate we were pleased. We chose Tuesday, Wednesday and Thursday because of what they had to offer those days. Buildings are only open on certain days. Each day we packed our lunches and headed out around 10:00am and left around 4:00pm. We parked at the visitors center for free and then took the shuttle into town. It takes a little more time but saves money and time on our feet. From the time we got into the town and left, we only sat down for lunch, snack and day we saw two plays. The rest of the day is walking and standing in the buildings talking with the shop keepers. On Tuesday we visited the courthouse where we were able to experience 18th century law for the colonist. I was chosen to be a member of the justice. The girls wanted to but you must be 18. On Wednesday we started our day by taking the Governers House tour which included a great chocolate making demo. They didn’t eat chocolate mixed with milk in the solid form back then, they mixed the crushed beans with water drank it like coffee. They’d mix in spices like cinnamon or chili peppers. After the tour, we sat in the quiet back gardens and ate our picnic lunch. We picked the seeds out of cotton and spun it into thread and them weaved it in a loom. We also visited the wheel making house, foundry, and shoe makers house. Abby played the Harpsachord at the furniture makers building. It was so cold and windy all day but the girls still wanted to eat ice cream. We ended our day with a talk at the archeologist building. We thought the archeologist talk that we signed up for was going to be at the dig site but it was actually in the archeologist building. I didn’t want to be rude and leave the tour so we stuck it out and surprisingly the girls enjoyed the retired principals lesson. On Thursday, we took the Capitol tour and then ate our picnic lunch near the capitol, watched an outdoor play at the first theater built in 1720. Be also watched another play inside the Raleigh Tavern, this one was about the enslaved and free African Americans of Williamsburg. During the 18th century, half of Williamsburg’s population was black. It was a show not to be missed. Friday we headed over to Yorktown to finish out our history triangle tour. Yorktown is another open-air living museum that chronicles the British troops surrender to the United States at the Yorktown Battlefield in 1781. This area is managed by the National park service so we we watched the film they had to offer, explored the indoor museum and grounds as well as took a walking tour of the main town area. You can buy the Audio CD ($5) in the bookstore for the drive through the battlefields and redoubts, which I highly recommend. We also got a driving tour map of the downtown area so we could go see Nelson’s house. Thomas Nelson Jr was one of the signers of the Declaration of Independence. In the side of his house you can see a cannon ball that is lodged into the side from the Battle of Yorktown. The girls earned their junior ranger badges.